Everyday, we are bombarded with the need to make decisions; some are easy and some are difficult. 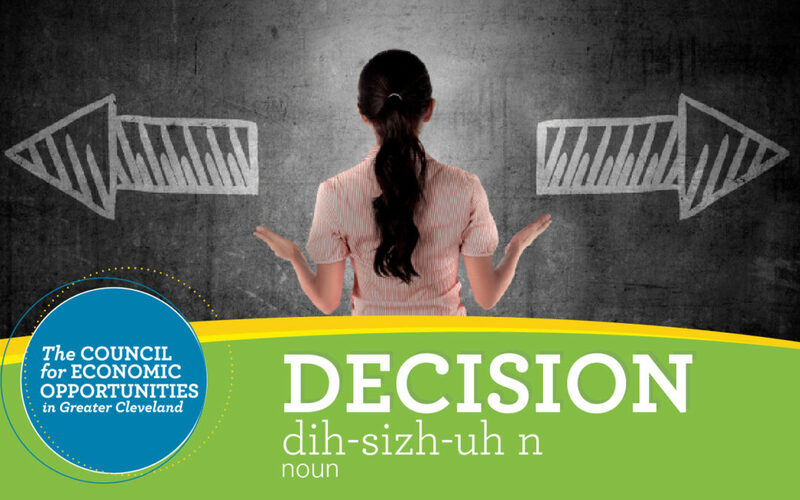 For many of the families we serve at the Council for Economic Opportunities in Greater Cleveland (CEOGC), decisions can mean the difference between getting help in the time of need or going without. I met a young woman, who faithfully went to work everyday. She always had a smile on her face and a kind word. One day, we were riding the elevator together and I noticed that she had a haunted look in her eyes. I asked her if she was okay, she responded that she was, but I knew in my heart that something was burdening her. I continued to pry gently until she finally said that she recently moved and had no idea how she was going to pay her heating bill. I told her that we provide emergency services to those in need and referred her to one of our committed staff, who took her to his office and learned that, not only did she need help with her gas bill (it was winter), she had to sleep with her son because they only had one bed and it helped to keep them both warm. I later learned that this very proud mother had to work two jobs to make one paycheck, and that she worried constantly because her company did not provide sick or vacation time; so if she missed a day, she wasn’t paid. CEOGC was created to help people during these times of distress and uncertainty. Through our various programs, individuals and families are given a helping hand, a word of encouragement and a way to move forward. However, without a decision to access the services we provide, basic needs go unmet, children miss opportunities to grow and develop in a nurturing, educationally enriching environment and individuals don’t explore the necessary steps for a new life or career. For my former colleague, her decision to apply to the Council for Economic Opportunities’ emergency program provided her son and her a warm apartment, a new bed for her son and the assurance that help is available.